With nearly two decades of experience in the business and a string of critical and journalistic successes, Amelyn Veloso has become one of the most respected news anchors in the country. A longtime TV5 newser, Veloso made a surprise move last year to Solar News. "I had grown as a broadcast anchor and journalist and had developed lifetime friendships with many of my (TV5) colleagues. But when I saw an opportunity to revert to anchoring in English since I had anchored English newscasts in Channel 13 and Channel 5 in the past, I felt it was the right time to move." Veloso told us. Since becoming part of the Sunny Network, Veloso has seen her broadcasting career soaring to new heights — instantly making her one of the Solar pillars. Veloso was kind enough to grant us this long overdue interview wherein she opens up about her life and TV career, her advice to journo moms out there striving to find a work-life balance, and many others. Hi, Amelyn! You recently celebrated your first anniversary as part of the Solar News team. How do you enjoy being part of the Sunny Network, so far? I have enjoyed every second of it. 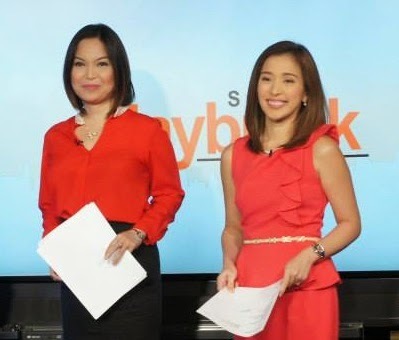 For the past year, I’ve been busy anchoring Solar Daybreak and producing a segment called “Everyday Success” (featuring prominent personalities and newsmakers) as well as special reports and features for Solar News. I was also sent to my hometown Cebu last September to cover the aftermath of the earthquake there. Just this February, I was also sent to Tacloban for an update three months after Yolanda struck. So overall, it was a very productive year for me. Let's talk about your show, Daybreak. You've been the co-anchor of the show for more than a year now. How do you enjoy anchoring the show so far? I love anchoring Daybreak. I have anchored other newscasts in practically almost all possible time slots in Solar and even in my previous networks. But I do love working this early. To me, it allows me to finish more work as it feels like I have more time. Also, I enjoy working with Claire and the rest of our Daybreak team. We do a lot of talking and laughing even off-cam! Speaking of Claire, you two, I should say, have the best anchor duo chemistry on morning TV today. Why do you think your chemistry with her works well on-cam? Claire and I actually ask that question too. Whatever we do or say on air when we banter is not scripted. What you see on air when we banter is really how we are off-cam. We’re actually crazier and more irreverent off-cam. We share our personal experiences and laugh with and at each other. It helps that the entire Daybreak team is very supportive and encouraging. Though you only see me and Claire on air, there are many other hardworking fellow Daybreakers behind the scenes that makes Daybreak, Daybreak. Are you a morning show person prior to joining the show? I have always liked mornings. But my previous anchoring jobs assigned me to mostly evening time slots. So in effect, there were times when I get home very late in the evening. So naturally, waking up early was less likely during those times. Post by Solar News Channel. Your sudden transfer to Solar News from TV5 created buzz in the local journalistic community, and Kapatid viewers were shocked seeing you joining a new network considering you've been a longtime "kapatid." What was the reason why you made such a big move? I was with TV5 for almost 14 years and have witnessed its many incarnations. With the ABC5 family, I had grown as a broadcast anchor and journalist and had developed lifetime friendships with many of my colleagues. But when I saw an opportunity to revert to anchoring in English since I had anchored English newscasts in Channel 13 and Channel 5 in the past, I felt it was the right time to move on. But they (TV5 bosses) made a counter offer, right? At that time, just before I left TV5, it was only a few months after Balitaang Tapat was cancelled. There were talks then to develop a weekend newscast for Raffy and me. I was also going to be part of TV5’s new media. How would you sum up your experience with TV5 and could you share to our readers some of the valuable experiences/lessons that you picked up from working at the Kapatid Network? I grew as a broadcast anchor and journalist in TV5. I started as an English news anchor and later as a Tagalog news anchor. For those who do not know yet, I am Cebuano so I had to learn to speak better in Tagalog. Thankfully I became more fluent in the language. With them, I learned to not only anchor but also to produce. There was a time then when TV5 had lesser resources and staff so we had to be a producer, researcher, writer and host all rolled into one. I was one of the producers of Dokumentado when it was still a segment/mini-documentary within the primetime newscast. I also produced then a segment called “Ten Peso Meals” where we featured chefs and culinary students to prepare meals worth ten pesos per servings. Lesson would be to learn from mistakes, move on and do better. I had hits and misses — and there are times when people will laugh or sneer at these mistakes. I’ve learned that the best thing to do is learn, move on and do better. This remains true till this day now that I’m with Solar News. You've been a journalist for almost two decades now and your whole career has been in TV. What would you say is your best body of work as a journalist? It’s hard to decide which would be my best body of work. I feel it is yet to come. Besides, I believe to come up with my best work should be my goal every day. The best is what I strive for every day at work. Sometimes I succeed, sometimes I falter. Also, I believe that even if I received good feedback from a story or interview I presented, it is my best only for that day. To me, it is important that I keep myself in a learning mode. To always be open... that there is always something I can improve about myself. With the changes that happen in all areas all the time, it is imperative to be updated and be ready for any change that comes. Bring us back to the time when you were starting your career as a journalist. How's Amelyn Veloso back in the day? Amelyn Veloso before was thinner [laughs]. Kidding aside, I was like anybody who was at the starting point of his or her career — gaining experience, gaining knowledge, gaining expertise. My first job on TV was as a sales coordinator for a TV show, and I only earned an allowance of 500 pesos per show as a voice talent. Since most of the sales I got were only exchange deals, my commission was mostly food gift certificates. But as a newbie, I believed that I needed the experience more than the money. It was through that experience though that more opportunities in TV opened up for me. Do you miss anchoring or reporting the news in tagalog? How would you describe your anchoring style? I am more fluent in English so it’s the other way around for me. I had missed anchoring in English. But I’d gladly anchor a newscast in tagalog if Solar News requires me to. I am comfortable and able to anchor in both languages. I also pinch hit on Solar News Cebuano. My anchoring style is straightforward and sincere. How do you maintain that level of professionalism and credible image for so long? Thank you for seeing me that way. Well, in whatever work that came and or comes my way, I remain straightforward, sincere and kind. Also, I make it a point to continue learning whether it pertains to new skills and or new knowledge. How long do you envision yourself staying in this business? As long as I can or as long as God wants me here. And for as long as I enjoy what I do, then I am here for the long haul. My closest friends now would be my Solar News colleagues. I also maintain my friendships with all of my fellow anchors and colleagues from my previous jobs. Though we are not able to see or talk to each other, I know that when we do get a chance to do so, it would be as if we never parted ways. You recently attended Raffy Tulfo's birthday and reunited with some of your TV5 friends. How's it like hanging out with your former colleagues? We enjoyed the company and the food at Raffy’s party. It was nice hanging out with my former colleagues. Many may not be aware but you once executive produced Raffy Tulfo's weekend public affairs program. How would you describe your style as a producer? As a producer, I’m very thorough whether it’s for a full-length show or a segment. I put a premium on all the aspects of producing. From pre-prod, to prod and post prod. I’m open to the ideas and inputs of the members of the production for as long as it remains within the objectives of the program. Also, I prefer working with those who are as dedicated as me. And together, as a team, we complete the project. Being that you have that experience, do you have any say or control on the overall flow of Daybreak? What do you want to tweak on the show, if there is? As an anchor of Daybreak, I can share my ideas or give suggestions. These are discussed with the group though, particularly with our executive producer. That way, we can come up with an output that is beneficial to all concerned. Best part would be to hear first hand and tell the story of some of the most interesting individuals — regardless of age, status or gender. Worst part would be to hear first hand and tell some of the most heart-wrenching stories. You seem really busy, Amelyn. How do you manage work and family? Time Management. And I thank God for giving me a family who is my number one supporter and my number one critic. Given that you're a "veteran" in the business, what would be your best advice to working journo moms out there striving to do it all at the same time? Know yourself. As in any endeavor, I believe that if you know yourself well, then you would know how you can best manage your life. That’s also how you can reach decisions that may have been pending for some time now. Only you would know what’s right for you to do or not to do. I can assure you though, sometimes, by just having that drive to make the best life for your family, somehow, it pushes you to make better decisions. However, if life does go awry, as I said earlier, learn, move on, do better. Life is as easy as you believe it to be. Ultimately, what do you want to achieve with Solar News? Any new shows in the works? I do truly believe in our slogan, “Inform. Inspire.” That’s also my goal with my work in Solar News — to inform and to inspire. As for new projects, let’s wait and see. The network continues to expand so definitely, there will always be something to look forward to with Solar News. And last, what's the best advice you can give to aspiring journalists out there? If you know for sure that being a broadcaster or journalist is your true path, then buckle up and be ready for an extraordinary, fun, though at times, overwhelming ride. It’s not always going to be an easy one. But if this is truly where you should be, things will work out well for you.